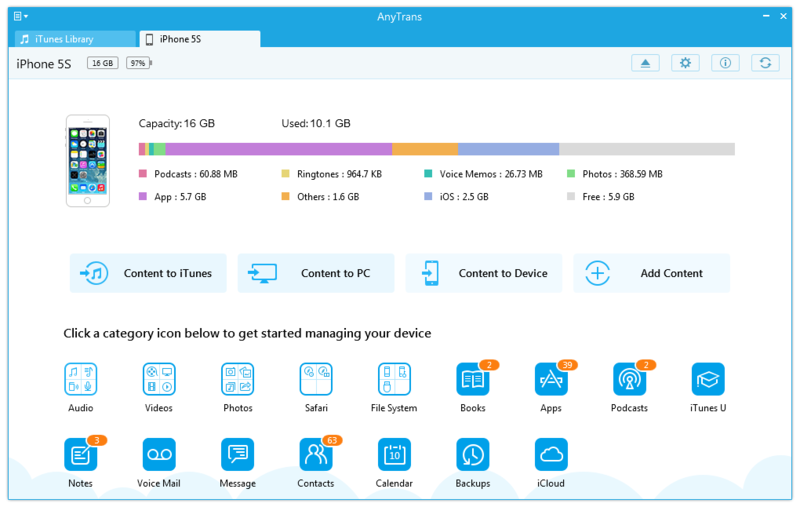 AnyTrans is an all-in-one iOS contents manager which supports freely data-transfer, iCloud-management and device-backup for all the iPhone iPad and iPod users. No matter you want to transfer a contact number to a new iPhone, or you need to export your iCloud backup to the PC, AnyTrans is the best way to go. Wherever your iOS contents are saved on computer, iTunes or device, AnyTrans gives a hand to put them to anywhere as you want. It supports four types of transferring modes, iDevice to iDevice, iDevice to computer, iDevice to iTunes, computer to iDevice. It offers a simpler, faster and smarter way to take overall control of all iOS media files, like music, ringtone, video, camera roll, photo stream, apps, etc. AnyTrans makes up for the shortcomings of iTunes. It is available to preview personal info and gives fully supports on almost all kinds of personal info, media data, and app files. Taking AnyTrans, you are able to manage and transfer music, photos, videos, contacts, messages, notes and more to anywhere you like. AnyTrans is the Only tool that enables to download your iCloud info, such as call history, contacts, notes, apps, etc. It can load all your info from iCloud and preview it to selectively extract to computer from iCloud. And Then, you can add those contents to your device. As for the backups, it can recognize all backups existed on your computer, including iTunes backup. If you have no backup, AnyTrans will remind you to backup. Unlike Android system, iPhone iPad cannot be used as a USB drive. That is to say, you can not add, move, or clone those contents from your device only if jailbreaking your device. With AnyTrans, you can add, delete, and change the name of folders & files on device for better use. For jailbroke device, it enables to change the apps name. Minimize its window while transferring contents, which won’t bother your other works. Drag and drop to add or export contents with more easily and freely. Automatically convert videos to the format that your device supported. Automatically skip the repeated songs while transferring them to iTunes library. Complete all contacts information with head portrait via Edit button on your PC.